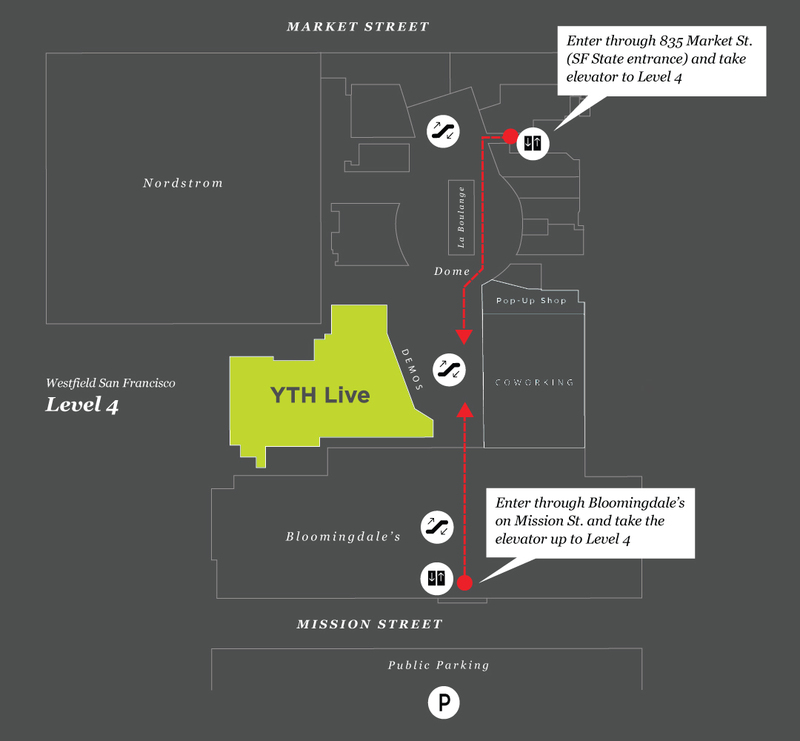 YTH Live will be held on May 5-6, 2019 at Bespoke in downtown San Francisco. Bespoke is located on level 4 of Westfield San Francisco Centre, next to Bloomingdale’s. We have partnered with Hotel Zelos for your convenience and a discounted rate. Book by telephone: 1 888 459 3303 You must mention “YTH Live” to get the discounted room rate. The discounted rate is first come, first served. Quantities are limited. There are two public parking garages located conveniently near Westfield San Francisco. Westfield San Francisco Centre is located at Powell Station. The Powell Street Muni lines J, K, L, M, N, and T stop at the Centre. Bus lines 5, 6, 7, 9, 21, 31, and 66 will bring you directly to Westfield San Francisco Centre by exiting at 5th and Market. There will be volunteers and clearly labeled signage inside the mall to point you to the right direction. Please enter through the 835 Market Street (SF State) entrance**, as all other Westfield entrances will be locked until 10am. Enter through 835 Market Street (SF State entrance) and take elevators to Level 4. After 10am, you may enter Bloomingdale’s on Mission Street and take the elevator up to Level 4. Bespoke is located just outside of Bloomingdale’s inside the Westfield Shopping Center.